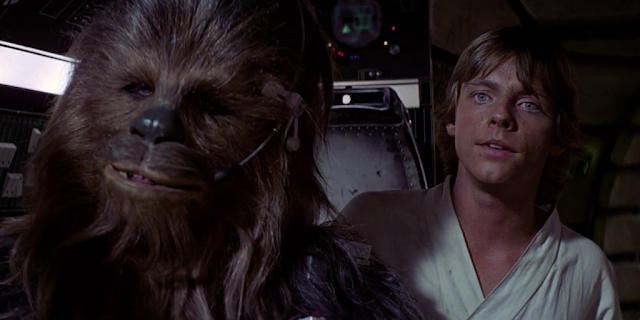 The Star Wars movies are among the most quotable films around. Some lines have slipped into a permanent part of everyday culture. “That’s no moon” and “I find your lack of faith disturbing” are used all the time. It’s used when a character is about to enter into a situation that could end poorly, whether finding out the moon is not actually a moon or you’re about to try and rescue a kidnapped Sith Lord. The phrase is spoken twice in A New Hope and Return of the Jedi. Every other movie says it once. Han Solo says the line three times, Obi-Wan twice. In total the line has been said 10 times by 7 different characters. The quote has been mixed up a little bit so we have also heard the following variants: "bad bad feeling," "very bad feeling," or "really bad feeling;" and also as "I've got a bad feeling about this." So Obi-Wan Kenobi says Obi-Wan to Qui-Gon Jinn at the start of the movie. Anakin Skywalker at Geonosis in the arena when he realizes what’s about to be released to eat them. Obi-Wan Kenobi talking to Anakin Skywalker as their starfighters approach the ship, the Invisible Hand in their attempt to rescue Palpatine. "I have a very bad feeling about this." For the second time in the film – Han Solo says it when the trash compactor on the Death Star starts. Princess Leia, while inside the belly of the space slug, just before the mynock creatures appear. "Artoo, I have a bad feeling about this." "I have a really bad feeling about this." Han Solo upon realizing that the Rathtars have been set free. K-2SO says "I've got a bad feelin-" and then he is cut off. The line is not spoken in English, nor by a human. BB-8 says it to Poe Dameron just as as they are about to begin their suicidal assault on the Dreadnaught. Han says when flying the Falcon into some danger "I’ve got a really good feeling about this" which is, of course, the complete opposite of the famous line. One of my favorite Star Wars-isms :) Nice post- thanks! Thanks for coming by! May the Force be with you. Always. This is during the force awakens, not Rogue One. I had to stop by for some Star Wars-isms today guys. May the 4th be with you!